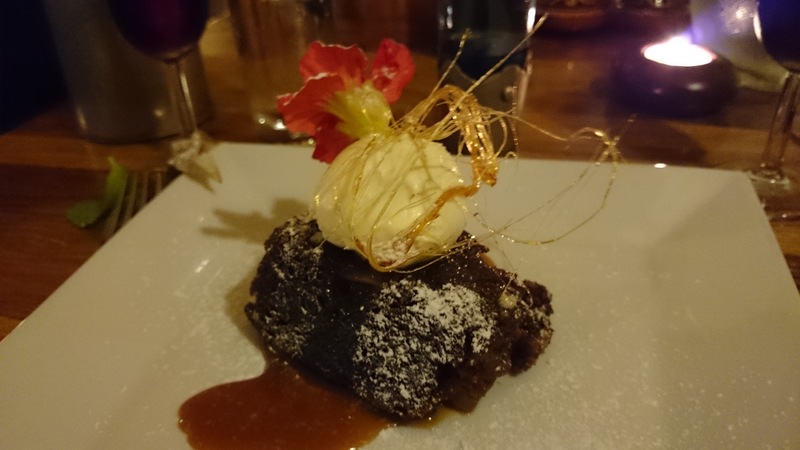 Occupying a prime position on Dunster High Street within a stone’s throw of the historic Yarn Market, you will find a most excellent eatery, Reeves Restaurant. Owned and managed by Justin & Claire Reeves, they have built for themselves an enviable reputation. Before I turned up for the review, I asked a few locals what they thought. They all with one accord sang the most excellent praises about this popular restaurant: a relaxed atmosphere, amazing food and a warm and friendly welcome. Well, I have to say that was the experience of our night. It was a fine summer’s evening and we were ushered out to the rear garden to relax whilst our table was being prepared. Enjoying the still, tranquil summer air, we were served drinks and olives as we sat by the shrubs and scented flower beds in anticipation. It wasn’t long before Claire Reeves emerged to take our order. There was no scribing on a waitress order pad but instead, she effortlessly committed the exact details of our order to memory and relayed the pertinent details to her husband and Head Chef Justin, in the kitchen. Once our table was ready, we re-entered the restaurant and sat down at our cosy, corner table. From here we could rather interestingly observe the eating habits of our fellow diners. Well you need to do something to while away the time don’t you? Homemade bread and a large, beautifully crafted butter rosette were placed on the table. This kicked the evening’s dining off to an excellent start. Our wine of choice for the night was a favourite of mine: Argentinian Malbec at a whopping 13.5%. For those of you out there that are still drinking the Merlot and Shiraz, I implore you to try this little gem from South America. I don’t think you will be disappointed. Laden with mouth-watering flavour and aromas, it is everything a red wine should be: full bodied and satisfying. It wasn’t long before my seafood starter made an appearance. I’d ordered the Fritto Misto (fried seafood and vegetables) of sea bass, squid, crab cake, tiger prawns and scallop… served with a trio of dips. Talking of which, the dips were stylishly served in something akin to white ceramic teaspoons. This gathering of seafood not only set the taste buds alight, but the plate was truly a picture! Justin’s creative flair was truly something to savour – literally. The main dish was the sumptuous Garlic and rosemary and lamb rump with root vegetable crisps, fennel puree and a redcurrant and mint jus. Now I really adore the taste of lamb and I can tell you that this did not disappoint. Succulent and loaded with flavour; all the additions on the plate just complemented the dish perfectly. I was now beginning to understand why Reeves has got such a solid local reputation. It is at this point that I should add that Justin cannot take all the credit for the amazing food being churned out of the kitchen of Reeves Restaurant. Working alongside him was the very young, but talented Abbie Smith. During the attainment of her NVQ catering qualification with Barbara Hancock of West Somerset College, Minehead, she has recently won both the Eat Exmoor and Eat Somerset cookery competitions. For her efforts, Abbie scooped the coveted ‘Chef of the Year’ for the West Somerset region. We moved inexorably towards dessert and it was at this point, rather interestingly, we were offered a drinks menu containing whiskeys, liqueurs, coffees and… pudding wine. What a great idea (other restaurants please take note)! It is so rare that you are offered dessert wine, and this was fabulous surprise. After some quick deliberations, I opted for the enchanting and mysterious Elysium dark Muscat. All in all, the entire experience was virtually faultless from start to finish and one I hope to repeat in the not too distant future. The Somerset village of Dunster is replete with great places to eat but Reeves Restaurant is an absolute must. And I think, like the loyal locals, you’ll be returning again and again.